Today was was going to be another challenging day with muddy forests and I was keen to get away at first light. The sun is rising later and later each day now and it’s just light enough to start walking without the aid of a head lamp just after 7am. Once my morning alarm went off, just after 6am, my hand automatically reached back over my head to perform the daily task that would ensure I got up and moving – opening the valve to my mattress to deflate it, listening to the pssttt… of the air flowing out. With the mattress flat it gets uncomfortable lying on the ground so there is nothing for it but to rise, toss the sleeping bag aside and get the day started. If I didn’t deflate the mattress, it would be so tempting to sleep in just a little longer. Given that it was a dry camp I filtered my water for the day ahead from the bladders I carried from the last forest, brewed a coffee and hooked into cereal. This was my final tent camp on Te Araroa and it was a pleasure to be able to pack the tent up dry. After four months on the trail I have honed my camp packing up skills to a fine art and was ready to leave just as there was enough light. The first few hours of the day were easy. Walk through Island Bush on forest roads, cut across a farm property and out to a road, to walk 6 km to the Longwood Forest. On reaching the start of the forest the trail stayed on forestry roads for another 4 kilometres leading uphill through plantations to the start of another tramping standard forest track. The road walking was easy enough but I didn’t know what to expect from the Longwood Forest – I’d heard mixed reports of deep mud to being an easy, beautiful walk. Add all the mixed reports together and they form an accurate description of the Longwood Forest. The trail immediately enters beech forest and for the first kilometre or so it has sections of mud but dry mud, if that makes sense. Not enough mud for your feet to sink through or for the mud to stick to your shoes, more like mud that would be really sticky with some rain but for now had been settled and compressed with the passing of many boots. What did strike me for this first section was just how ancient and mystical it looked. Fairy tale stuff for sure. I wouldn’t be surprised if hobbits, elves or goblins jumped out on the path ahead. Long, pale green tendrils of moss covering trees branches, thick mats of spongy moss the ground, iridescent fungi growing in damp hollows, and ancient looking beech with crooked branches intertwining above. Beautiful and mystic. Mats of exposed roots crossed the trail, waiting to catch a foot. Further into the forest the true mud began. It always starts with small holes that ca n be skirted around to keep shoes clean and dry. It always ends up with one stepping in a hidden hole, sinking deep, covering shoes, soaking socks and having mud scrap up your legs as your foot is pulled clear. From there it doesn’t really matter how deep or long the mud is, you can’t get any dirtier, or can you? So you end up plowing right through. Longwood didn’t disappoint with the mud but there was more to come. Just before leaving the forest for the first time to enter into open tussock country, towards Bald Hill, there was a series of wet, boggy sections to get across. On getting through these and the tussocks to top out near the towers on Bald Hill my feet were soaked. It would have been good to find a clear stream to wash them but there wasn’t one to be found. Rising to the top of Bald Hill, views out towards the coast and Bluff occupied my vision. It was sunny and a great place for lunch overlooking the remaining hills of Longwood Forest, Riverton and the curving coast line to Invercargill, only a few days away. The finish line in sight. But the trail wasn’t done with its tests for trampers just yet. It seems fitting that Te Araroa starts with beach walking, muddy forests and roads only to end with exactly the same. The last few days providing a reminder to anyone who has come this far south of the trials and tribulations that have been endured along their journey. The toughest tussock section encountered two days ago, it just wouldn’t seem right if the trail didn’t end with another crazy arsed, eyeball deep mud section, beach walking and bitumen road walking. That is exactly what it provides. From the top of Bald Hill there were a few kilometres of road walking on the service roads for the tower, down hill, to the start of the last forest section that would take the rest of today and most of tomorrow to complete. Along the edge of the road several small trickles of water ran from the side cut bank. This was the last water source until pretty much reaching Martins Hut. This was quick walking and good timing. On reaching the security gate, one of the workers was opening the gate to get his vehicle through which avoided me a climb down the steep bank to get around the gate. 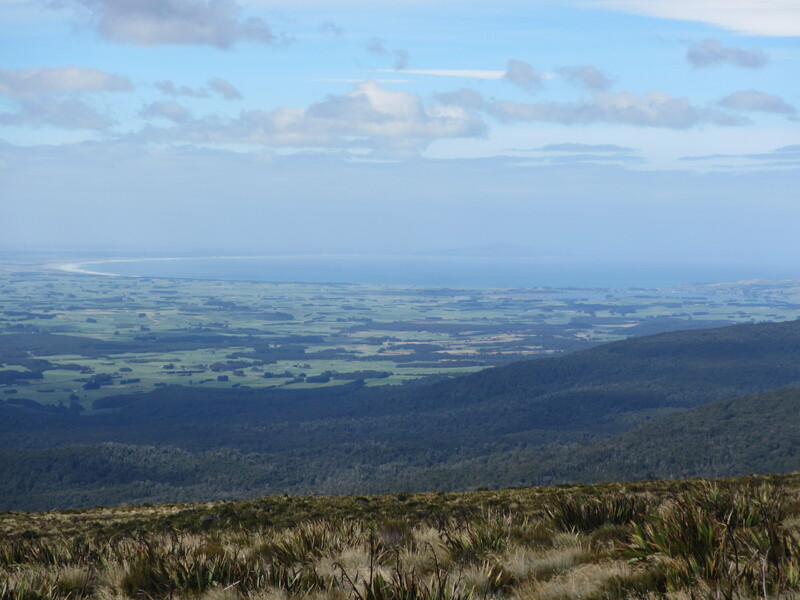 We got chatting for a good 10 minutes and he was able to give me the heads up on the trail section ahead – a steep climb, lots of mud, tussocks on the bald hills, and a steep muddy descent to Martins Hut. He wasn’t wrong. The only thing he didn’t mention was the wind blown trees across the track that required scrambling under, over or punching a path in around the sides. It was muddy. Long pools of thick, sticky, stinking mud. 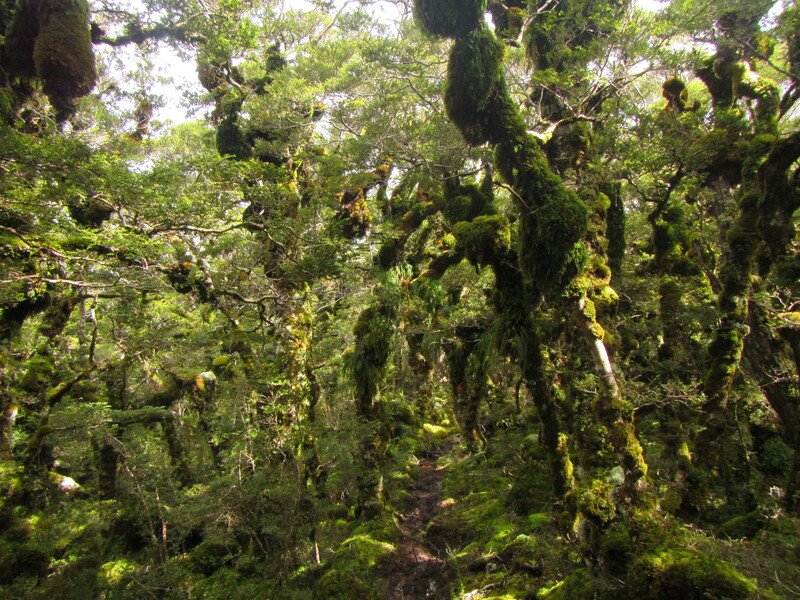 The climb solid, passing over a rooty track in amongst more of the same mystical beech forest. Plants grew on top of other plants. Lots of vivid greens in the sun light and moisture from rain last night. This forest soaks the wet stuff up and retains it well. 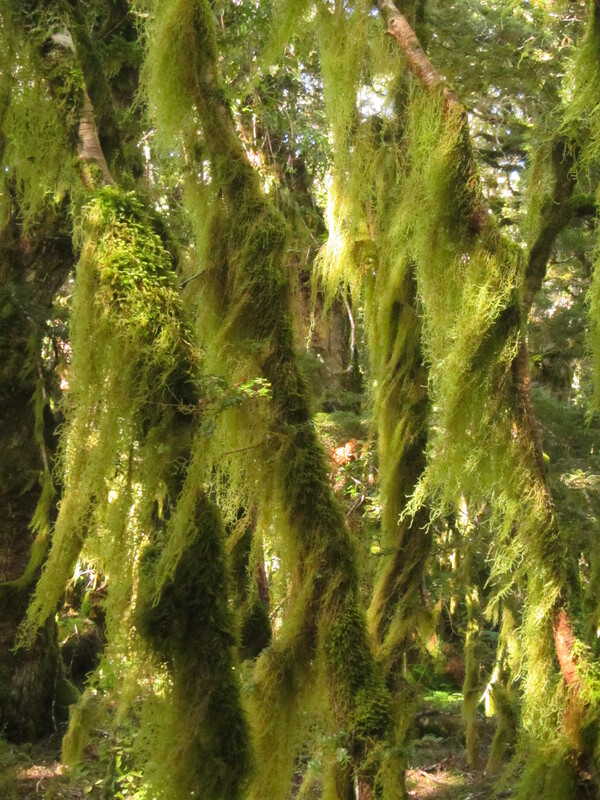 The mosses were like sponges from which moisture could be squeezed out. Approaching the top of a bald hill offered clear views across the remaining forest section for the day and tussocks further on. 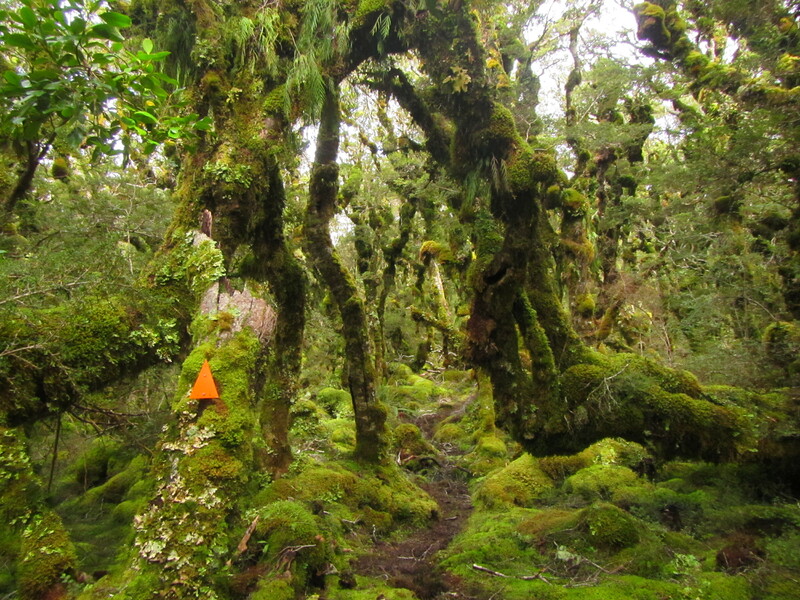 For the next 3 kilometres the trail moved between forest and small tussock patches. All wet, all muddy, before finally emerging into a long tussock section following a ridge to a few high points giving up nice views to the coast below. Starting the descent down towards Martins Hut I only had another 1.5 km to go but it was slower moving than I anticipated. The mud got worse. Not quite as bad as the descent from hell off Pirongia some months ago, as it wasn’t as deep or long, it still sucked. Steep sections of rooty stairs, moving from one pool of mud to the other. My shoes were covered in the stuff. My ankle gaiters were no assistance in keeping it out of my shoes either as stepping into it, the mud would lift up the sides exposing the shoe opening and allowing big chunks of the stuff to get in between shoe and sock. Yuck. A few months ago I would have been cursing. Now, I accept the trail for what it is, always thinking it could be worse and just move through it. I can’t not. There is no other way off the mountain without mud now and Martins Hut is not getting any closer. There was no way I was camping here either and resolved to just keep going, putting one foot in front of the other and moving towards Bluff. Things can always be worse. It could be raining, snowing and windy. Instead it was a sunny day and its just mud. It will wash off. The 2nd last day of having to deal with it. So I pushed on down to Martins Hut. I saw and smelt pale grey smoke rising from the chimney before I saw the actual hut. Arriving at Martins Hut, the last hut on Te Araroa, I saw a tent outside and numerous sets of walking poles and boots lined up drying out the front. It was only a 4 bunk hut and it looked like I’d be camping in my tent for the night. It was an old, run down hut, full of character. Holes in the floor and a big open fire place, remains a dry haven for trampers. Opening the door I found Mat, Bella, Tom, Rune and Celistino sitting around a nice fire. All the bunks were full and Rune would be camping in his tent, exiling himself for snoring. Looking around for a suitable tent site (there were not many), the others wouldn’t have it and cleared enough space on the floor to allow me to roll out my mattress and sleep on the floor later on. Perfect. With sleeping arrangements sorted my priority was to find water to wash down in. Pushing through thick vegetation for 5 minutes from the hut brought me to a small running stream that would do the job. The pool of clear water soon turning cloudy brown as I walked straight in to wash the mud from my shoes, socks, gaiters and legs. I knew things were sort of clean when the fresh water in the creek started to run clear once more. The evening was spent catching up, munching food, laughing and sharing tales. Much of the chatter was around heading to the finish line and the fast approaching end. What would we do next? Continue to travel, go back to work, stay in New Zealand or further abroad? We all had different ideas, opportunities and commitments. We wondered as well where POD, Disco, Solenne and Antoine might be at and whether we would grace us with their presence tonight. It was a chilly night and the hut draughty. Mat cut a mountain of wood that would see us through the night. With the fire stoked up, boots and socks were hung to dry and dinners were cooked. Great company and good times, I just wished I’d packed in a nice Piont for this section. Soon enough it was dark and we were all in bed, me spread out on the floor in front of the fire, designated fire fighter for the night to ensure the hut didn’t burn down. I’m sure I had a few people worried during the night. As the fire died down to red embers I would stoke it up. Sudden bursts of yellow flame springing the fire back to life, a few heads would turn to make sure it was just the fire and not the hut alight. – [ ] not be so expectant. Always assume huts will be full and there will not be room. The ruckus continued for a long while after, as both then rifled through packs with head torches to find their gear and get to bed. I rolled over to sleep as best as I could.